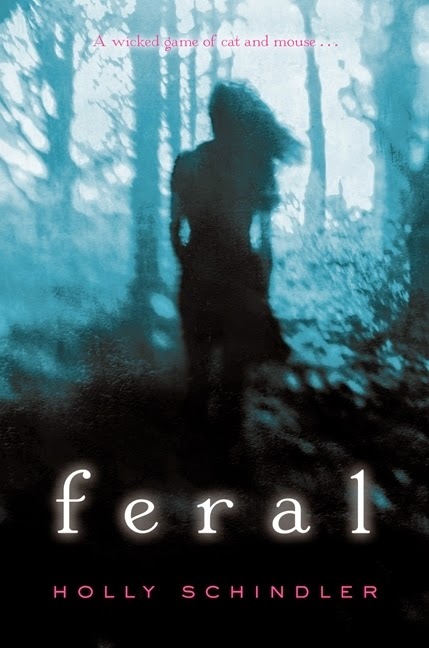 Feral by Holly Schindler. Harper Collins. 2014. Review copy from publisher. The Plot: Two girls: one dead, one left for dead. Serena is the dead girl, but it's her story that starts the book. Claire is alive, having survived a brutal attack months before. She's the new girl in town, arriving at the same time Serena's body is found. Claire finds herself drawn into the mystery of Serena's death: was it an accident? Or was it murder? The Good: The cats. Oh dear lord, the feral cats. I thought I was going to say that the scariest scene was Claire's attack. A confident teen, walking home alone in the dark, chased and surrounded and beaten and left for dead. But then I think of the feral cats, the ones that went after Serena's dead body and that scene, and the later scenes were the cats seem to come after Claire, and I think, no, that's the scariest scene. This is a mystery, yes, about what happened to Serena. The reader, from the start, knows what has happened: "The body belonged -- or really, the body had once belonged -- to Serena Sims, a B average junior who loved her best friend, the sound of the rain, writing for the school paper, and her mother's chocolate mayonnaise cake with homemade icing, a family specialty. . . . Seventeen and dead: it was the worst kind of vulnerable." Serena is dead, but she is somehow still present, still feeling everything. And sharing all that, every bump and thump as her killer drags her body and dumps it. And then the cats come. But there is only so much that Serena shares with the reader. Then there is Claire: still recovering, physically and psychologically, from her attack months before. She is drawn to Serena's death for many reasons, one of which is that everyone else seems to believe that Serena's death is accidental. It turns out that Claire's new house was one that Serena lived in years ago; the first teens she meets are friends of Serena's; the local feral cat is the cat Serena fed. As the story progresses, as Claire chases down the truth, Serena's ghost -- if that's what she is -- grows unhappier and unhappier with her own death, and more dangerous. Damn, those feral cats are scary. No no no NO. I am already a little bit scared of cats! I do not need to add feral cats to the list of things I worry about when I'm walking alone in the dark. Eeek. And I thought Warriors was scary!! Feral cats are scary creatures!